After the Germans advance on the British Expeditionary Force in Normandy there was a very real threat of invasion and so on the 14th May 1940 Sir Anthony Eden sent out a call from the BBC at 9pm. This was followed by notices in all the papers. He was asking for volunteers aged between 17 and 65 (though there were exceptions, some 14 year olds joined up as did many over 70) to form a unit for defending Britain called the Local Defence Volunteers (LDV) locally known as "Look, Duck & Vanish" or Last Ditch Venture. Within minutes of the call going out local Police Stations were besieged by men wishing to join up. They ran out of forms and there was still a queue next morning of men wishing to sign up. 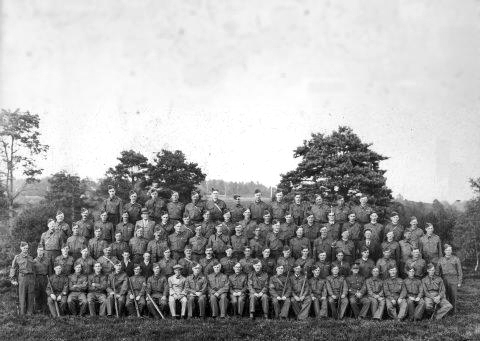 Local civilians in Bordon, Whitehill and Blackmoor formed a unit of over 90 men. The photograph of them was taken beside the Whitehill Club. It included Col Knox who had been the Colonel Commandant Commanding Bordon Garrison in 1923 - 1926 and Col Wrey - Saville.